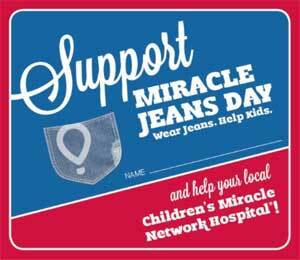 Miracle Jeans Day can be held any day you like but is generally held in September of any given year. 1 in 10 kids in North America is treated at a Children’s Miracle Network Hospital each year. Every single day, nearly 16,000 children visit the emergency rooms of their 170 member hospitals. Wearing jeans may lead to a more comfortable day in the office for you, but on Miracle Jeans Day it also generates hope for families relyingon the services of a CMN hospital. A simple $5.00 donation could supply 10 diapers for a premature baby. A $25.00 donation could provide 5 baby blankets. Best of all your donation stays local to help kids in your area.